The gene expression pattern in tumor cells differs from that in corresponding normal cells. In order to identify differentially expressed genes in colorectal tumors and normal colorectal epithelium, a differential display experiment was used to compare RNA expression in normal and tumor tissue samples. One gene fragment was expressed only in normal tissue and not, or to a much lesser extent, in the adenomas, carcinomas and cancer cell lines. The isolated gene fragment was identical to Aquaporin 8 (AQP8), a water channel protein. In situ hybridization demonstrated that AQP8 was expressed in the cells facing the lumen in the normal colonic epithelium. Our result suggests that the expression of AQP8 is a marker of normal proliferating colonic epithelial cells and suggest these cells to be involved in fluid transport in the colon. Many genes are known to be involved in colorectal carcinogenesis. Colorectal cancer is sometimes inherited in familial syndromes like Familial Adenomatous Polyposis (FAP) or Hereditary Nonpolyposis Colorectal Cancer (HNPCC) . The identification of the predisposing genes in inherited tumors have meant great contribution to our understanding of colorectal carcinogenesis in these families but also of carcinogenesis in general . The majority of colorectal tumors, however, are sporadic, and studies in sporadic tumors have revealed other genes of importance in colorectal tumor development, e.g. K-Ras , TGFβ , E-cadherin , SRC  and the PPARγ . Genes may be altered in tumors compared to normal tissue without necessarily being causative. Tumor cells often de-differentiate or have their origin in immature cell types and loose expression of proteins associated with highly differentiated cells, and could in stead gain expression of embryonic proteins. These alterations can potentially be used as clinical markers to define a particular disease entity, useful for diagnosis, staging, population screening or even to detect the presence of occult metastatic disease, recurrent disease and response to treatment. The perhaps most known embryonic protein used as a tumor marker in malignancy is the CEA in colorectal cancer . In an attempt to identify additional genes altered during the development of colorectal cancer, we compared the gene expression pattern between normal colon epithelium samples and colorectal tumors using the mRNA differential display PCR (mRNA DD-PCR) method. In this paper we report that the water channel protein AQP8 is expressed in the normal columnar epithelial cells of the colonic mucosa facing lumen and that adenomas and colorectal cancer do not seem to express this protein. One gene fragment of approximately 80 bp was expressed in the 4 normal tissue samples but not, or to a much lesser degree, in 24 colorectal tumors in the mRNA DD-PCR experiment. The band was cut and reamplified using the same primers, and cloned. Clones were then selected by size, and by using inverse northern hybridization it was found that all clones represented the same DNA sequence. Sequencing and subsequent search in the genome database showed that this differentially expressed gene fragment corresponded to the sequence of aquaporin 8 (AQP8). The result was confirmed with RT-PCR on newly synthesized cDNA and northern blot hybridization (Fig. 1) on the original samples from the mRNA DD-PCR experiment. The number of samples used for northern blot was small depending on limited amounts of RNA from the samples. We extended the experiment and included besides the 28 samples used in the mRNA DD-PCR, another 7 sporadic colorectal cancers, 3 samples from normal colonic mucosa, 5 sporadic colonic adenomas and 3 HNPCC tumors from patients with known germline mutations in hMLH1. Using a semiquantitative RT-PCR it was found that samples from adenomas, rectal cancers, and colonic cancers, including those from HNPCC patients, expressed the AQP8 to various degrees, but generally to a much lesser extent than normal colonic tissue (Fig. 2). The expression of AQP8 in some tumors could be explained by a normal cell contamination in those samples. Northern blot demonstrating AQP8 in normal colonic tissue, and not in adenomas, or carcinomas. Symbols first in sample identification relate to type; N, normal, H, HNPCC carcinoma, C, sporadic colonic carcinoma, R, sporadic rectal carcinoma, P, adenomatous polyp. RT-PCR comparing expression of GADPH2 and AQP8 in normal colonic tissue (N), adenomas (P), colon (C) and rectal (R) carcinomas and carcinomas from HNPCC-patients (H). GADPH2, 25 cycles of PCR amplifications and AQP8, 35 cycles of amplification. To study what cells expressed the AQP8 mRNA, in situ hybridization was used. In samples from 2 normal colonic mucosa there was a staining of mRNA AQP8 expression in the columnar surface epithelium only (Fig. 3a). No expression of AQP8 was detected in any of one sporadic rectal carcinoma, one sporadic colon carcinoma or one HNPCC carcinoma tested (the HNPCC carcinoma is shown)(Fig. 3c). The RNA in situ experiment suggested that only normal mucosa expressed AQP8. In total 15 colon cancer cell lines, six microsatellite unstable (SW48, LOVO, HT116, RKO, LS174T, DDL1) and 9 microsatellite stable (SW480, SW620, HT29, CACO2, Crl7184, Crl7456, Crl2405, 238CCL, 233CCL), were tested for expression of AQP8 using RT-PCR. 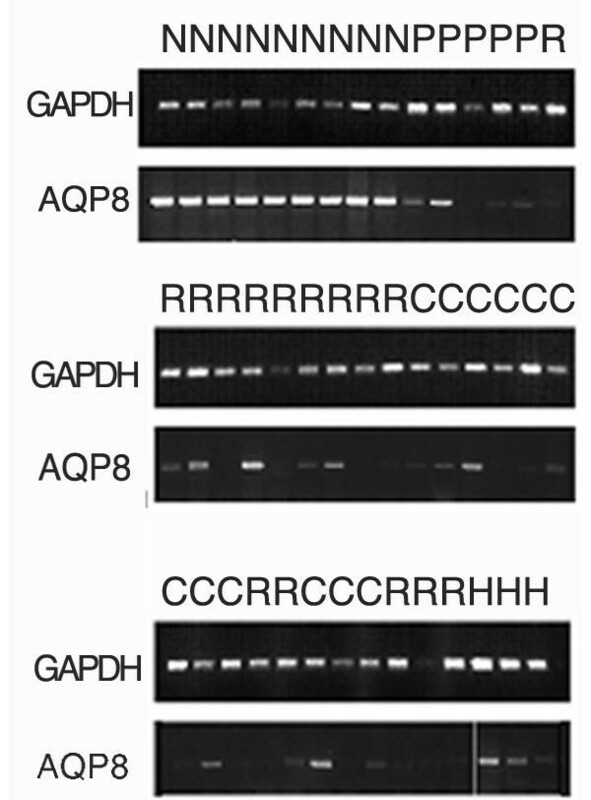 None of them demonstrated expression of the AQP8 transcript, supporting the hypothesis that tumor cells do not express AQP8 (Fig. 4). This study was designed to detect additional genes altered during colorectal carcinogenesis. One of the genes found, AQP8, was expressed in all normal colon samples but not, or to a less extent, in the colorectal tumors. The expression of AQP8 in tumor samples in Figure 2 can be explained in two ways. It is possible that adenomas and cancer cells do not express AQP8 in these samples and that the PCR products results from normal cell contamination. Alternatively it is possible that adenomas can develop in a cell already differentiated to express AQP8. The known function of this gene and the in situ hybridization result from this study suggest this protein to be a marker of fully differentiated epithelial cells. In the maturation process of cells from the colonic crypt, the stem cells differentiate to become either goblet cell in the crypt or surface epithelial cell . This experiment suggests that the expression of AQP8 is limited to the differentiated mature columnar epithelial cells. None of the cell types in the crypt, including the stem cells seemed to express AQP8 in our in situ experiment. Tumors did not express AQP8. The reason for this can be that this gene has been downregulated in tumorigenes. Another, perhaps more likely, explanation could be that tumors arise in immature cells. There are other proteins whose expression is of late appearance in the life cycle of a colonic crypt cell, like the epthelial Na+ conductance channel ENaC  and maxi K+ channels , which could have been picked up by this experiment similar to AQP8. The reason why they were not picked could be related to the fact that using a limited number of primers not all differentially expressed genes will show up. Furthermore, since these genes are mostly expressed in distal colon cells, and not in proximal colon cells they would not have been identified by us as differentially expressed between normal and tumor tissue and therefore not selected for further studies. Aquaporins (AQP) are members of the major intrinsic super family of integral membrane proteins, which act as specialized channels to facilitate the passage of water through the cell membrane in animals, plants, and bacteria. So far 10 AQP homologues named from 0 to 9 have been cloned in mammals. They are widely distributed and more than one AQP could be present in the same cell . Several human AQP genes have been cloned and an increasing number of disturbances have been found associated to the abnormal function of these proteins . The human AQP8 gene was cloned in 1998 and was shown to be important for cell fluid transport . Expression of the gene was demonstrated by northern blot in human pancreatic and colonic tissue . It is generally accepted that water transport in the gastro intestinal tract is secondary to osmotic driving forces created by active salt transport to hydrostatic pressure differences and absorption takes place despite high effective osmolarity of the faeces. Several studies have suggested the colonic crypts to be the major sites of both fluid absorption and agonist-stimulated fluid secretion . Recently AQP8 was demonstrated to be expressed in the absorptive columnar cells of the jejunum and colon in rat by in situ hybridization and it was suggested that AQP8 had a role in water intake and/or outlet in the gastrointestinal tract . In mice the AQP3, AQP4 and AQP8 are expressed in the colon surface epithelium, suggesting a combined role of these aquaporins in fluid transport [15,16]. A) Antisens, RNA-in situ demonstrates AQP8 in normal colonic columnar epithelium from one patient. B) Sens, RNA-in situ demonstrate no signal. C) Antisens, HNPCC carcinoma demonstrates that there is no AQP8 expression in the tumor. Epithelial cells of the crypt formation on all photos give an autoflorescence seen as white borders in the pictures, the probe hybridization is seen as small white dots. RT-PCR demonstrating that there is no expression of AQP8 in any of the tested colorectal cancer cell lines. Line one, normal mucosa demonstrate the band corresponding to AQP8 expression. Our finding of AQP8 expression in human columnar surface epithelial cells, suggests these cells to be involved in water resorption in human colon. Since mRNA-in situ hybridization showed a positive signal for mRNA expression of AQP8 in the normal columnar surface epithelial cells and no signal from the cells in the crypt (Fig. 3), this indicates that the expression of AQP8 is a marker only of fully differentiated surface colonic epithelial cells. mRNA differential display RT-PCR (mRNA DD-PCR) was run on a panel of 24 fresh frozen colorectal tumors and 4 normal colon mucosa tissue (collected at the Umeå hospital 1987-1991). All tumors were at stage Dukes´ B. For the expression study with RT-PCR and Northern blot, we used the same tumors as above plus another 3 normal colonic tissues, 7 sporadic colorectal carcinomas, 5 sporadic adenomas (collected at Umeå Hospital 1987-1991) and 3 HNPCC tumors (collected at Karolinska Hospital, Stockholm). The RNA in situ study used samples from the above-described tissues. From all patients samples were obtained immediately after surgery and frozen at -70°C. The cell lines SW48, LOVO, HT116, RKO, LS174T, DDL1, SW480, SW620, HT29, CACO2, Crl7184, Crl7456, Crl2405, 238CCL, and 233CCL were cultured in Dulbecco´s modified Eagle´s medium (DMEM) supplemented with 10% heat-inactivated fetal calf serum (Gibco), 100 U/ml penicillin (Gibco), and 100 μg/ml streptomycin (Gibco) in 90 mm tissue culture plates (Falcon). Total RNA was extracted from frozen tissue by homogenizing with a power homogenizer (IKA Labortechnik) in Trizol Reagent due to manufacturer's protocol (Life Technologies) and used for mRNA DD-PCR, RT-PCR, and northern blot. The RNA was treated with deoxyribonuclease I (Ambion Inc). mRNA Differential Display RT-PCR (mRNA DD-PCR) was performed essentially according to the method of Liang and Pardee, using the one base anchoring primer [17,18]. Primers were synthesized by Genset Oligos. Anchoring primer for the AQP8 fragment was 5'-AAGCT11C-3' and the arbitrary primer was 5'-AAG CTT TTA CCG C-3'. Band was cut and reamplified with the same primers and then cloned without purification in a TA-vector (PCR II, Invitrogen). Clones were selected by size, followed by inverse hybridization . DNA was sequenced with Thermo sequenase radiolabeled terminator cycle sequencing kit (Pharmacia & Amersham). Homology searches were performed using Blast search in GenBank databases. Primers designed for the isolated fragments were used on template from tumors and normal colonic tissue for comparison of expression. In a volume of 40 μl, 2 μg total RNA was reverse transcribed with the following conditions: 5 mM MgCl2, 50 mM KCL, 10 mM Tris-HCl, pH 8.3, 1 mM dNTP´s, 1 U RNase inhibitor (Perkin Elmer), 2.5 U MuLV Reverse transcriptase (Perkin Elmer). The PCR reaction volume was 25 μl containing 500 nM of each primer, 250 nM of DNTP´s, and 2.5 U of ampliTaq (Gibco, Life Technologies). cDNA was diluted 1:20 in water and 10 μl of the same dilution were used for all samples and controls. The primers used were as follows for AQP8 1200r 5'-AAA TGG GGT GCG GGA AAT GAG-3', aqp8f 800 5'-CCT GCT TG TTG GAC TGC TC-3', and aqp8f 150f 5'-TGG CGA GTG TCC TGG TAC-3'. Glyceraldehyde-3-phosphate dehydrogenase was used as internal control with the primers: F 5'-GAA GGC TGG GGC TCA TTT G-3' and R 5'-GAT GGC ATG GAC TGT GGT CA-3'. Thermocycler (PTC 225, Mj Research) was used with an initial denaturation step of 94°C for 2 min, followed by cycles of 94°C for 45 s, 59°C for 30 s, 72°C for 30 s, and a final elongation step of 72°C for 5 min. PCR products amplified after 25, 30, and 35 cycles were separated on a 1.5% agarose gel containing ethidium bromide for comparison between samples and controls. Consecutive frozen tissue sections were taken from two normal colonic mucosa tissues, one sporadic colonic cancer, one sporadic rectal cancer and one HNPCC cancer. Fourteen μm sections were cut at -18°C in a cryostat (Jung CM 3000, Leica Instrument). One section was processed for RNA-in situ hybridization and the next was stained with Hematoxylin and Eosin (H&E). In situ RNA hybridization was performed as described previously . About 40 bp oligonucleotides from base pairs 165-205 were synthesized as sense and antisense (GeneSet oligos) and used as probes. The Swedish Cancer Foundation, The Cancer Foundation in Stockholm and The Lion's Cancer Research Foundation in Umeå supported this work. The authors would like to thank Susanne Petersson for valuable advice.